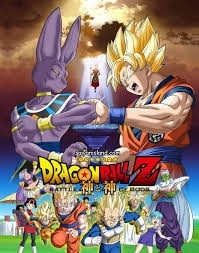 Do 你 think the new Dragon ball Z Battle of the Gods Movie is any good?. And when will it come out in English?. cause i still need to watch it. And if 你 seen it already what did 你 think of it?. I like Dragon ball Z ever scince i was a child back in 6th grade. And to find out there is going to be a new Dragon ball Z Movie comeing to the movie theaters. I was like wowo i have to go see that. But at the time i had no money and my friend had to work he 说 he was going to use his $100 gift card to the Harkions movie theater to go see that movie. And he had to work and coulden't make it. I never got to see that new Dragon ball Z Movie. So when is it comeing out in english?. And if 你 seen it already is it any good?. I need to know a little about this new DBZ Movie. yes it's the best movie (in English) scince all! Ok i am finally watching it right now. I like it based on me likeing Dragin Ball Z.